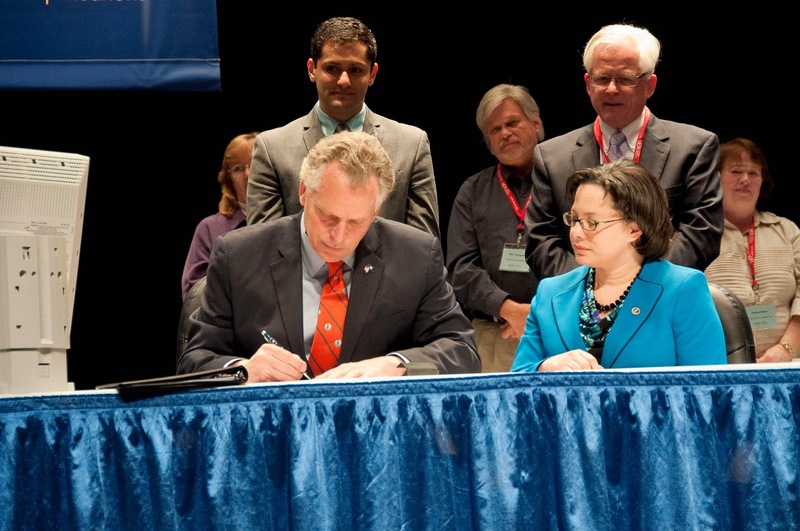 VEA-promoted bill signed by Gov. McAuliffe. He also took advantage of the opportunity to sign a piece of legislation in front of delegates, putting his pen to a bill protecting the rights of educators who are also nursing mothers. The bill came from a New Business Item at last year’s convention initiated by Stafford member Carol Huebner. “Having the governor sign legislation right there on our stage—that was historic,” says York County member Carol Bauer. 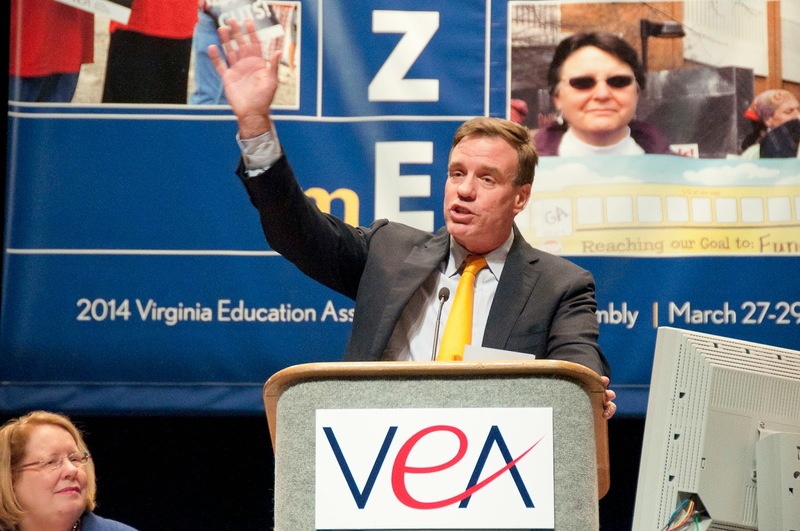 Warner brought convention delegates to their feet with comments like, "Doesn't it make sense, when making education policy, to talk to the people who actually do the job every day?" and "How a child learns is more important than how well he can memorize facts for a test." A busy ballot box. VEA President Meg Gruber, an earth science teacher from Prince William, was re-elected by delegates and will serve a second two-year term beginning August 1. Floyd County’s Jeff Pennington ran unopposed for vice president and will also begin a two-year term in August, and James Fedderman of Accomack County was elected to a three-year term as one of VEA’s representatives on the NEA Board of Directors. Winning seats on the VEA Board of Directors were Gwendolyn Edwards of Prince William, for Alternate ESP-at-Large, and Eddie Fifer and Dennis Pfennig, for Retired-at-Large. with VEA President Meg Gruber. from property taxes; reducing the importance of standardized test scores in teacher evaluations; setting a statewide maximum on class size; and increasing the Association’s digital media presence. Worthy recipients. The Association bestowed a number of annual awards, including the Friend of Education, VEA’s highest honor, which went to Beblon Parks, our own director of field support, organizing and minority engagement. She will retire this month after 34 years with VEA. Other winners included Precious Crabtree of Fairfax, who won the Award for Teaching Excellence; Bristol Superintendent Mark Lineburg and Assistant Superintendent Rex Gearhart, who received President’s Awards of Distinction; Sharon Stokes of Fairfax, the Education Support Professional of the Year; and Spotsylvania’s Renee Beverly, who earned the Mary Hatwood Futrell Award for Distinguished Leadership in Education. Sen. Mark Warner greets delegates. 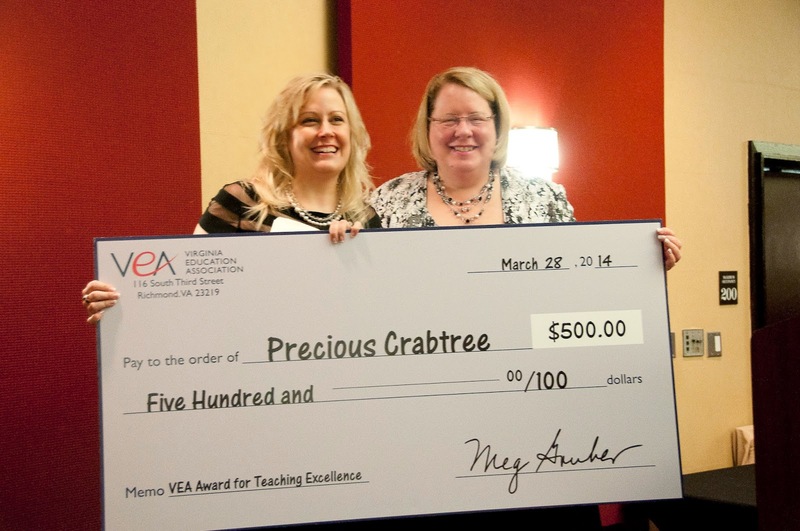 View photos on the VEA Flickr page. Watch videos of convention addresses on the VEA Vimeo account.